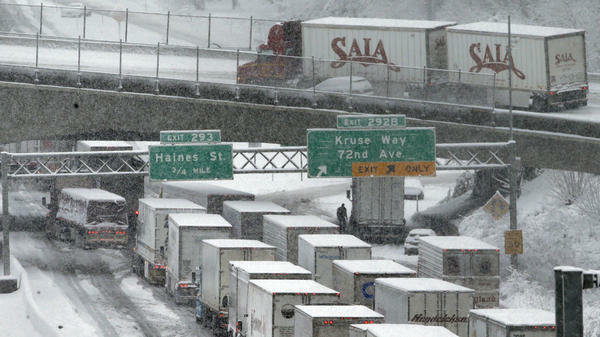 Next week, a new safety rule for truckers is supposed to take effect. The rule would require drivers to use tracking devices. The information gathered can be used to limit truckers' driving time. Highway safety experts are cheering while some drivers hope the Trump administration might delay the rule. NPR's David Schaper explains why. DAVID SCHAPER, BYLINE: The role of federal trucking regulators is a noble one - make the highway safer. But what does the average truck driver think? TODD SPENCER: They don't have a clue what truckers do, how they go about doing it, the schedules and things like that, the demands of the job. SCHAPER: That's Todd Spencer, executive vice president of the Owner-Operator Independent Drivers Association. He points to the federal hours of service rules, for example, which limits truckers to driving for 11 hours in a 14-hour period. SPENCER: Once your work day starts, then 14 hours later, it has to end whether you happen to have driven three hours or 11 hours. SCHAPER: Spencer says the rules don't account for the many delays drivers can encounter, and those are a huge problem because most truckers are paid not by the hour but by the mile. SCHAPER: And starting next week, the government will be able to better track truckers' hours because they'll be required to use electronic logging devices, or ELD's, eliminating the old paper logbooks, which are sometimes called comic books because they're so easily fudged. The reason for the rule - fatigue, a common cause of truck related crashes according to Robert Sumwalt, chairman of the National Transportation Safety Board. ROBERT SUMWALT: We see these issues in crash after crash, and we are tired of seeing commercial drivers being tired. SCHAPER: Sumwalt commented at a recent hearing on a horrific crash involving a tour bus and a semi last year outside of Palm Springs, Calif. In the predawn darkness, police briefly stopped traffic for some utility work. When the highway reopened and traffic started moving again, the semi remained still. Investigators say the truck driver fell asleep at the wheel. Two minutes later, a tour bus heading back to Los Angeles from a nearby casino with 43 people onboard crashed into that stopped truck with the sleeping driver, killing 13 people and injuring 31 others. SCHAPER: The truck driver had allegedly falsified his logbook to show more rest than he actually had. And investigators say the bus driver who was killed in the crash apparently didn't see the stopped truck in front of him because he too may have dozed off. They found that both drivers likely suffered from undiagnosed sleep apnea, which can cause fatigue. Obama administration regulators were drafting a rule to mandate that drivers be screened and treated for sleep apnea. But this summer, the Trump administration abruptly reversed course and killed the rule - as it has with other safety regulations. JOHN LANNEN: I find the current climate troubling. SCHAPER: That's John Lannen, who heads the Truck Safety Coalition. He says under Trump, regulators have killed a revamp of the motor carrier safety rating system, stalled a rule requiring speed-limiting devices and put other safety measures on hold at a time when serious truck-related crashes are on the rise. LANNEN: All the numbers are trending the wrong way. We're over 4,000 deaths a year now in truck crashes. It's been going up steadily, and we need to do something now. SCHAPER: Ray Martinez is expected to soon be confirmed by the Senate to head up the Federal Motor Carrier Safety Administration. He's suggested the administration will not delay the ELD mandate but says he's open to working with the trucking industry, which means more trucking safety rules could be on the chopping block. David Schaper, NPR News. (SOUNDBITE OF BRONTIDE'S "TONITRO") Transcript provided by NPR, Copyright NPR.